Trespass, 48 x 144 inches, pup not included. Oil on canvas with curio cabinet, and the Big Nugget. Available through the artist. Creeping along an overgrown trail, beside a river that lives in my mind as much as in the world. Branches slapping, leaves dripping morning dew. Stumbling over mossy, downed limbs, tree trunks and boulders, the smell of it earthy and rich. Seeing and hearing everything from birds to bears. There are blessed few biting bugs here in Oregon, but I love this just as much while being chewed alive hauling a canoe through the back country of Canada, pulling oars on an Alaskan river, paddling in the Adirondacks in NY, or slipping through the mangroves in Florida. Contact. The tactile experience of the world. Wind and water, the pressure while wading, the movement while paddling or hiking. The pulse of the earth. My mind is quiet, but wide open. Listen, smell, touch, see- all parts of the whole. All parts of me feeling most alive. That feeling is important. Vital, I think, to humanity. And I fear we’re loosing it, swept up in the bright, shiny and new. Entertainment. That’s what I try to paint, to put onto canvas. That connection with the earth, the environment, with life. Learning the language- my language- of paint has been an ongoing process for over thirty years. Influenced by artists from Thomas Moran and Winslow Homer, to Marc Rothko and Gerhart Richter, I seek a representational image, with the active surface of abstract expressionism- hoping to convey the tactile feeling of a place in the paint itself, as much as the visual record of a moment. And now, I feel like I’m at the beginning, my mind wide open, so much to see and learn. So much to share. I don’t know if I can ever be fully successful in conveying that feeling, but it’s what I’m compelled to do. Genesee River at Letchworth, 48 x 60 inches, oil on canvas. Available through the artist. Silver Creek V, 42 x 56 inches, oil on canvas. Available through the artist. Lamar Valley Erratics, Yellowstone National Park, 48 x 144 inches, oil on canvas. Available through the artist. Deschutes in Shadow, 34 x 50 inches, oil on canvas. Available through the artist. 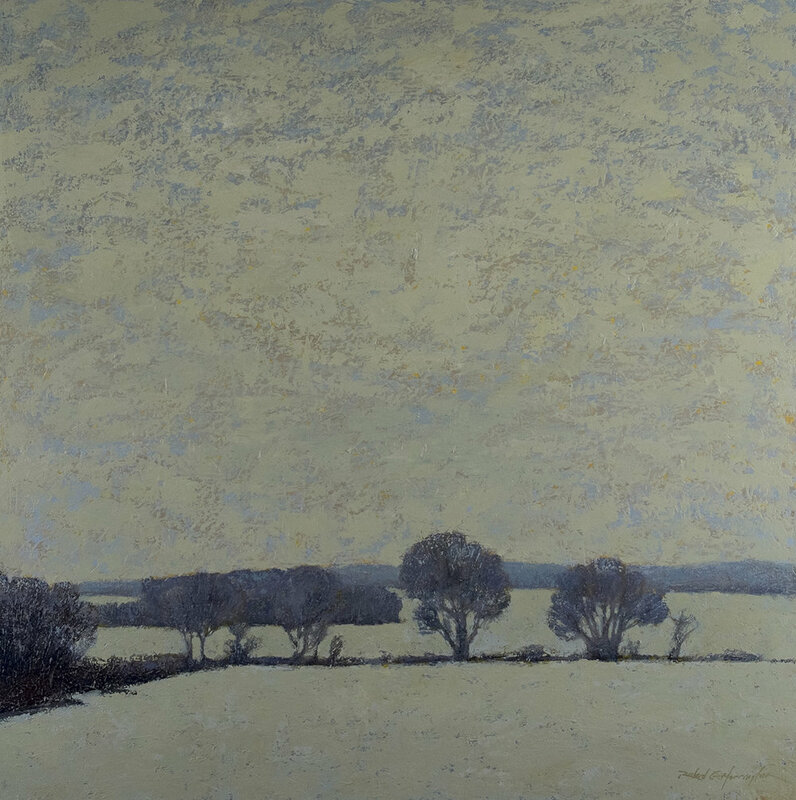 Snowfall, 48 x 48 inches, oil on canvas. Available through RARE Gallery of Fine Art. Along Kebler Pass, 48 x 110 inches, oil on canvas. Available through the artist. Flats at Dusk, 30 x 44 inches, oil on canvas. Available through the artist. Island in Summer, 40 x 32 inches, oil on canvas. Available through the artist. Grand Prismatic Hot Spring, 36 x 112 inches, diptych, oil on canvas. Available through the artist. 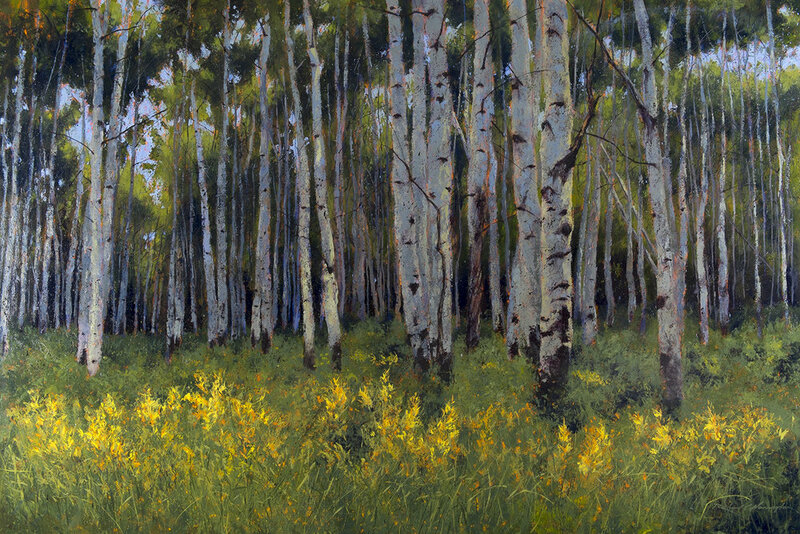 Aspen Along Kebler Pass, oil on canvas, 56 x 84 inches. Private collection.